The trending private equity investment sectors for March 2019 are highlighted below with a few example transactions. 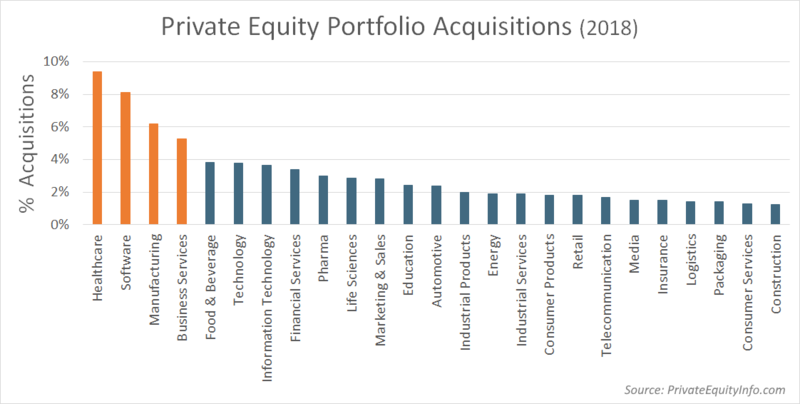 We reviewed all private equity platform portfolio company acquisitions in 2018 and categorized them by industry. The chart below shows the top 25 industries of interest for private equity. The trending private equity investment sectors for February 2019 are highlighted below with a few example transactions. We have previously reported that private equity, as an industry, is moving down market, increasingly investing in smaller deals. The question is, what company size ranges attract PE firms? In other words, how small, how big and are there any sweet spots in terms of preferred portfolio company size for new platform acquisitions? Compiling data from www.PrivateEquityInfo.com, the charts below show the platform acquisition criteria metrics for the private equity firms in our database. To simplify, each chart shows the minimum requirements for each metric (for example, minimum revenue, min EBITDA, etc.). We also have data on the maximum range for each metric, but I will group those together for a later study. In other words, this study is about the minimum deal size requirements for private equity firms. To be clear, this data is not based on transaction comps, but on the stated, desired range for platform acquisitions. (Note: we only record the size preferences for platform investments because there are often no minimums for add-on investments). 60% of PE firms will look at deals with revenue less than $10 million. 88% of PE firms will look at deals with revenue less than $25 million. I previously wrote about the trend of declining private equity investments in manufacturing and the subsequent increase in investments in Healthcare & Pharma and Technology companies, (as a percentage of the total number of platform portfolio companies acquired). To conclude this series that explains the shift in investment focus from manufacturing to other sectors, the graphs below also show a significant increase in private equity investments in Software and Software as a Service (SaaS) companies. As a percentage of the total platform investments made by private equity firms, software has doubled, from ~5% of deals to nearly 10%. I previously wrote about the trend of declining private equity investments in manufacturing and increasing investments in Healthcare & Pharma companies, (as a percentage of the total number of platform portfolio companies acquired). As a continuation of this analysis, the chart below shows a similar upward trend for private equity investments in Technology companies… now equal to the level we saw in 2000, at the peak of the first dot.com bubble. Want to see a similar trend line for a particular industry? Email me to discuss custom research options (ajones@privateequityinfo.com). The trending private equity investment sectors for January 2019 are highlighted below with a few example transactions. I previously wrote about the trend of declining private equity investments in manufacturing companies, (as a percentage of the total number of platform portfolio companies acquired). So, where is the focus shifting? The next few blog posts will aim to answer this question by looking at investment trends in different sectors. This post is about private equity firms investment trends in Healthcare & Pharmaceutical companies. The chart below shows PE platform investments in healthcare companies steadily increasing. Private equity portfolio company data from Private Equity Info shows clear trends of how private equity firms invest in certain industries over time. The graph below shows the investment trend for manufacturing, from 1990 through 2018. Private equity investments in manufacturing companies, as a percentage of the total number of platform portfolio companies acquired, continues to decline.